If you've been looking for more inspiration since our last post on 7 Feature Graphic examples some time ago, then you're in luck! Check out this spread of feature graphics with observations and suggestions on A/B tests that these apps could run. 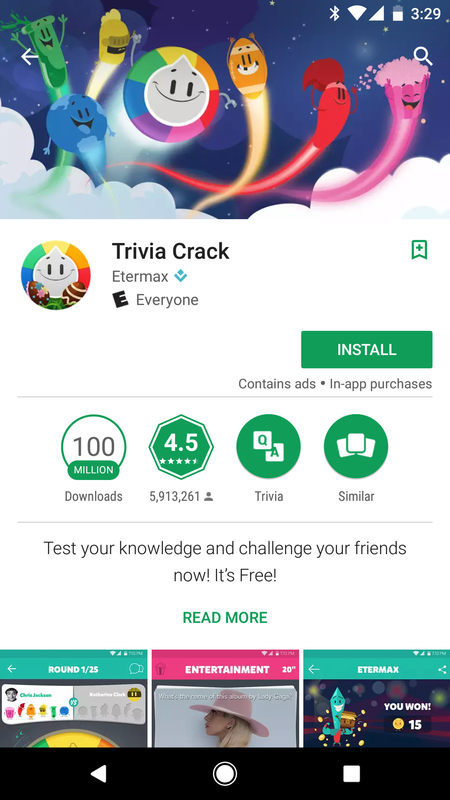 As a brief recap, the feature graphic is a 1024x500 banner that Android apps can show in the Google Play store. The feature graphic can be designed any way you like. 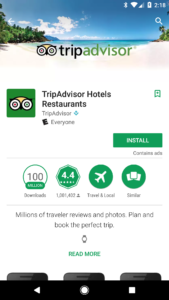 Apps which use a video will have their video appear as the feature graphic. The Weather Channel's feature graphic offers a visual that is immediately recognizable by users familiar with weather apps, which is the weather radar map. 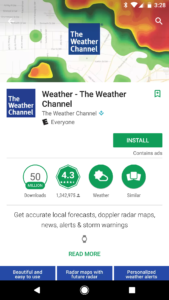 Not only is this a recognizable allude to an important feature of a weather category app, but it is also vivid and attracts the user's attention (though at this stage, the eye-catching appeal is less important given the user has already chosen to learn more about TWC's app after clicking in from an earlier impression). Including the icon in the middle of the feature graphic is, in our opinion, a wasted opportunity to either keep the design clean by using the radar map alone, or offer something new to the user (given the same icon is located just below the feature graphic). 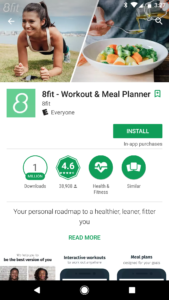 8fit's feature graphic choice is an excellent one for an app that ties heavily into a lifestyle use case, which is the split/screen shot. Here 8fit hammers home two association in the visitor's mind of 8fit's main purpose: helping people plan meals and workouts. 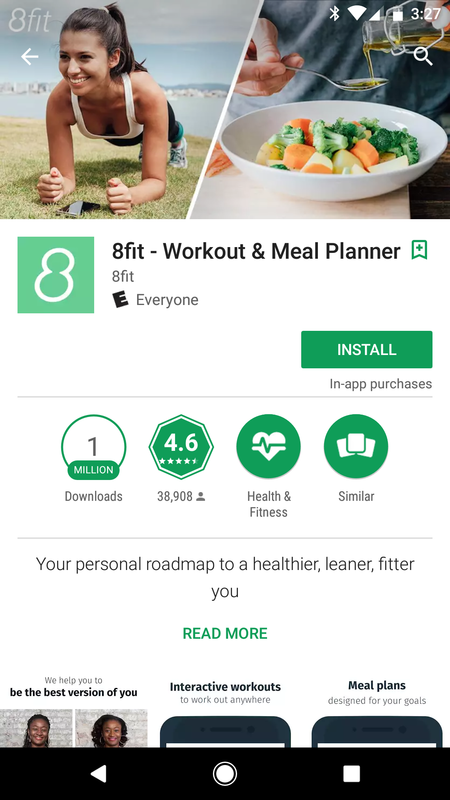 8fit's screenshots also follow the split/screen design, showing the ever-popular in the fitness world, before and after shot. 8fit also includes subtle branding by watermarking their logo into the top-left corner of the graphic, which is a nice touch. 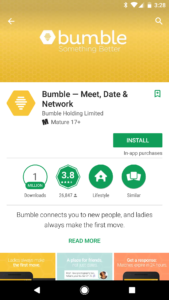 As many brands are wont to, Bumble opts for a plain and clean feature graphic banner with their brand logo, plus their word-based brand name. 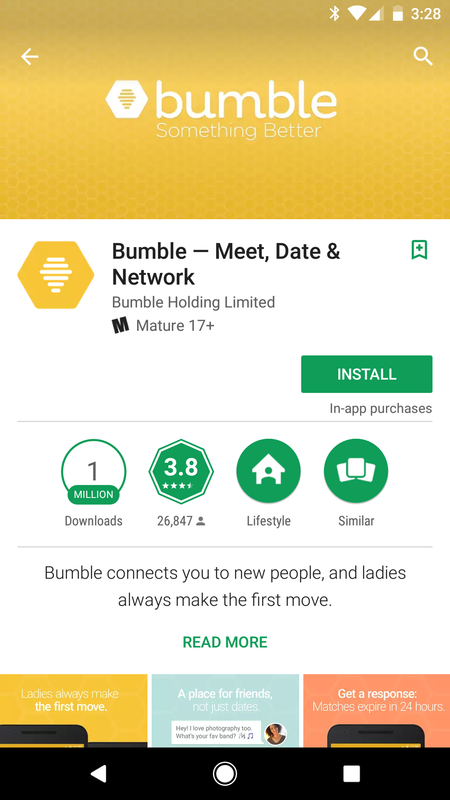 This jives with Bumble's branding scheme also embodied in the screenshots, which is a classy touch. Yet, the honeycomb sizes in the feature graphic are of a different size than those in the screenshots, which seems strange. This type of feature graphic is the easiest to implement, and most often does pretty well for brands, yet misses the opportunity to take a swing at being innovative. 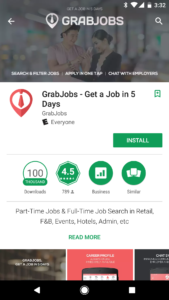 GrabJobs uses a slightly translucent stock image of a couple people in what looks like a relevant pose/situation as the main aspect, a few call-outs at the bottom and a brand logo and word-based name at the top (plus a subtle message repeated from the title and first screenshot, "get a job in 5 days."). A solid design that is nice to look at and informative via the call-outs and the slogan. 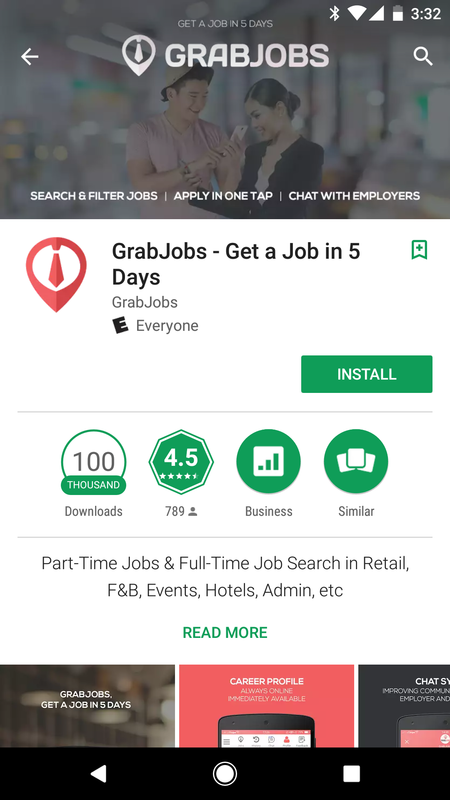 This feature graphic is good and may perform better than a Bumble-style brand banner for a lesser-known brand like GrabJobs, though this feature graphic is not great. When it comes to feature graphics for games, the sky is really the limit in terms of creativity and what goes into this app banner slot, so critiquing game feature graphics is a difficult task. 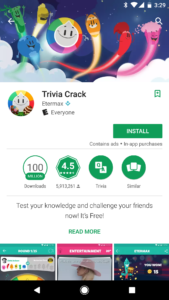 Trivia Crack here chose a fun and playful, branded approach, which may be the Bumble brand banner equivalent of the gaming world. 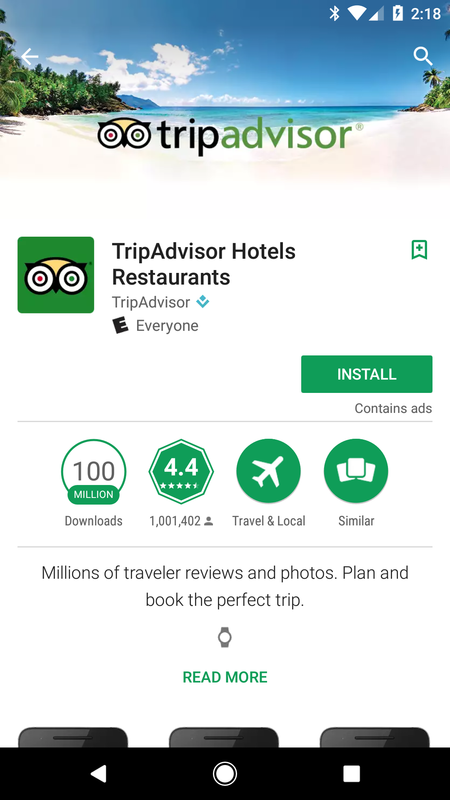 TripAdvisor's approach is a mix between The Weather Channel's and 8fit's, by combining the central logo theme with lifestyle imagery that relates to TripAdvisor's main use case. It is appealing, simple and encourages you to stick around on the page to look a little longer, thus making you more likely to read on and download (and this on-page staying power is the benefit of using real photos). 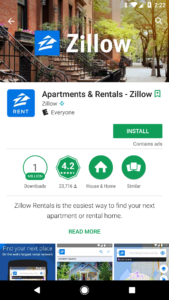 Zillow digs into the same vein as TripAdvisor and the prior mentioned apps with a real-world photo, overlaid with the brand icon and word-style logo. 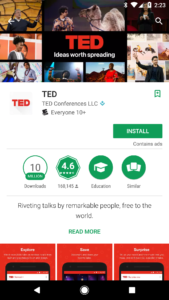 TED applies a variation on the real-world photo feature graphic by making a mosaic of photos surrounding the TED logo and slogan (yet it's worth noting that this mosaic style is the branded pre-roll for each TED Talk). 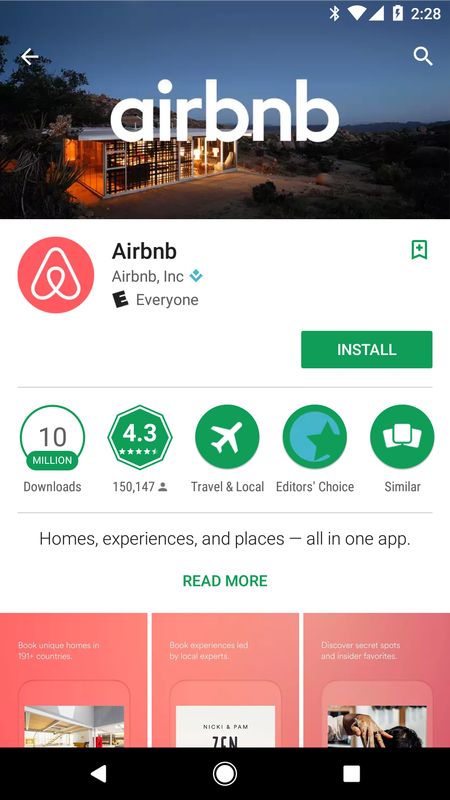 This approach is interesting, yet it is also a bit busy for a small screen and thus represents a departure from traditional feature graphic designs and may possibly cause confusion or dissatisfaction in users looking for a simple, straightforward understanding of an app. Test the white background TED l0go with black slogan text – color changes sometimes have a very dramatic impact on conversion rates, as website form designers know well! 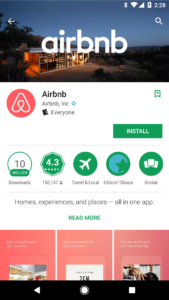 Somewhat surprisingly, Airbnb does not opt for the Bumble clean/simple branded feature graphic (though Airbnb's screenshots take this approach); instead, Airbnb follows the trend of overlaid branding on real photos (yet Airbnb does not repeat the brand icon, which is a nice touch of polish that the other apps miss). 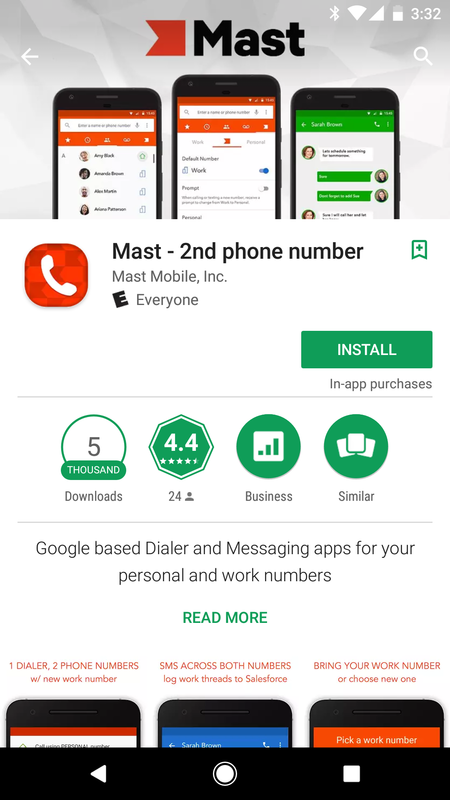 From our perspective, this style (offering a visual that builds an association with the app's use case) is the more effective approach to utilizing a Google Play feature graphic, vs using a simple branding banner. 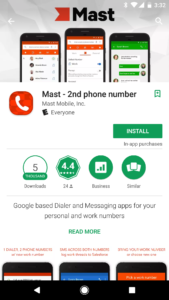 Mast here uses the rarely seen these days (yet entirely sensible and useful) approach of increasing the number of screenshots in the Play Store listing, by adding a few into the feature graphic. 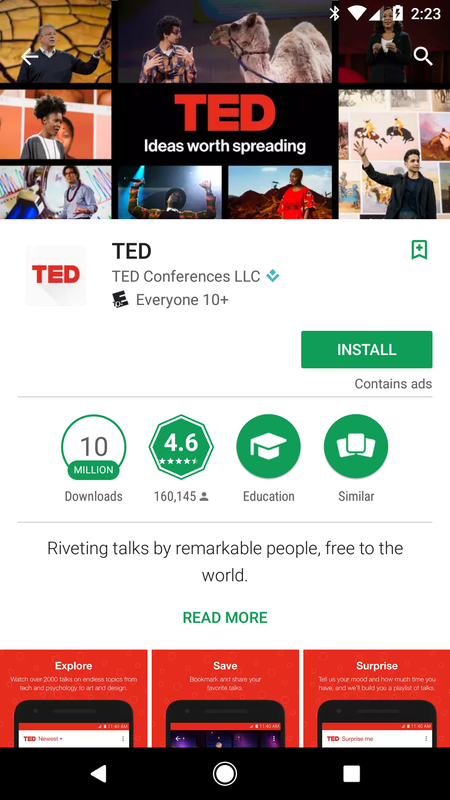 This allows users to see more of the app without having to watch a video, and is great for apps with a significant breadth of in-app functionality to show off (though three screenshots is a bit much and crowds the feature graphic, and the screenshots are cut off). Using the screenshots without the phone profile is an easy way to increase the size of the screenshots. In addition to the screenshots, the word-style logo and a different visual icon grace the top, as well as a poly-type background design, which is an intriguing touch. 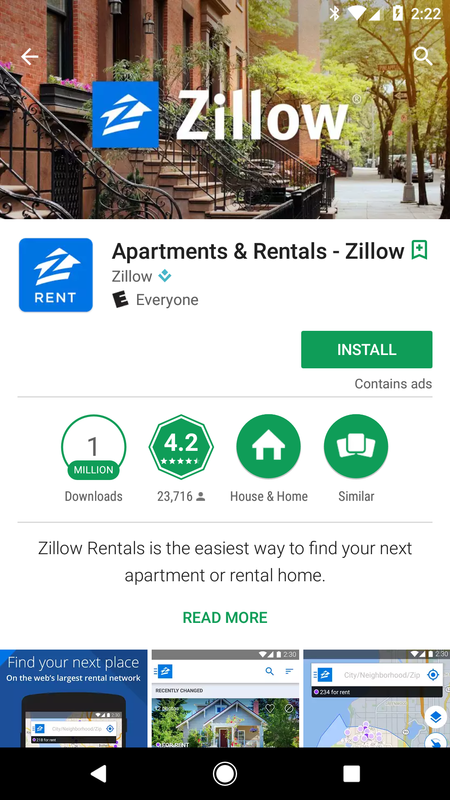 One issue that it appears that Mast has encountered (as well as Zillow) is that the background of a custom feature graphic like this or a photo can clash with the icon, the general Play Store UI and the screenshots, which isn't positive for cohesive branding. Re-arrange the presentation of the screenshots (e.g. stacking screenshots diagonally) – if done well, this could make the app seem more professional and mainstream, like a product you could pick up at the store.